Several months ago, it was pointed out to me that I had done several fantasy princess Pixie paper dolls, but there wasn’t a princely Puck paper doll to accompany them. I was going to get this done in color, but since I am behind on my coloring, I thought it was better to post it up today and then worry about finishing it up in color later. So, the color version will be up as soon as I finish it, either later this week or early next, I think. This month has turned out busier than I thought it would be. I traveled for the first week of January, got back to Alabama and then work picked up. I’d far rather be busy than bored, but when my life gets complicated, the blog sometimes suffers. I’m trying to keep up with the blog, as best as I can, though I feel like I have a lot of stuff “sort of done” and very little actually completed. Plus I owe my grandmother a set of magnetic paper dolls. She sent me a tin for her “paper dolls” to go in and I think if I don’t get them done this weekend, I may get another hint. She’s far to mid-western to flat out tell me do “get her damn paper dolls done”, but I suspect I will get further nudges down the line. I’ve never really gotten into superhero comics unless you count Deadpool or watching the Batman cartoon when I was a kid. When I do read comics, I stick to the compilations and some of my favorites have been Lucifer and Hellblazer, and of course, Sandman, but then, who doesn’t like Sandman? So, for the coloring of my superheros, I decided to go with simple primary and secondary colors without a lot of complicated depth. I wanted to reproduce a little of the feel of the old fifties comics, before computer printing made a lot of depth possible. I think I will always think of comics as being bright flat color, even though I know there are some wonderful and skilled artists who bring so much more to the genre. I’m sensitive enough to color that badly colored or art I don’t like, can ruin a comic for me. Needless to say, I really enjoyed drawing this set and I hope I will get to draw more sets like it in the future. 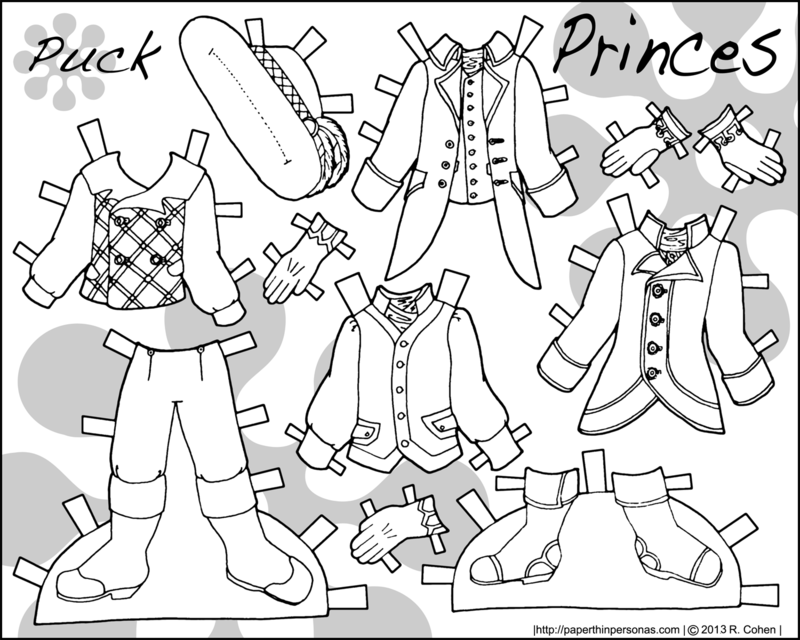 After I finished it, I did a little digging looking for other paper dolls aimed at boys and I found this nice list of free paper dolls for boys. And though it’s not a paper doll, I think one of my favorites was this paper city of paris. As I have mentioned before, I am a sucker for unusual and interesting paper toys of all kinds, paper dolls are just my favorites. 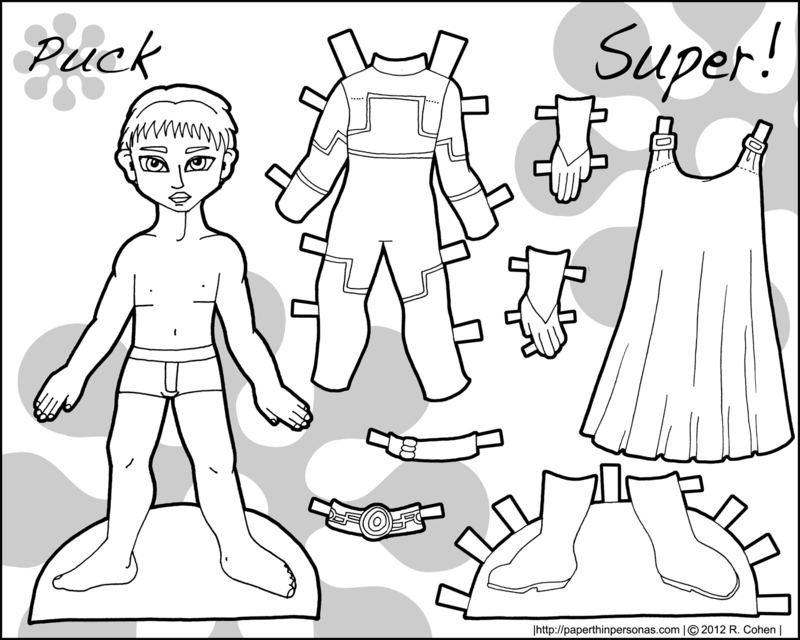 Puck Paper Dolls… For Boys? Back in May, a reader named Harper told me that I would make a little four year old boy really happy if I did this set. Since I’m always in favor of making small children happy (and because I always need Puck ideas) I decided to go for it. Here we have two Puck superheros in black and white. Tomorrow they will go up in full color, so that people who prefer their paper dolls in color can get their fix as well. I am going to confess right now that I have no real idea if the cape will really work. I tested it once with scrap paper and it sort of worked… I think the application of tape might assist in it’s functionality for the average child. Sorry about that. It seemed like a cool idea at the time, but in hindsight, perhaps it needed more testing. I usually try not to post things which I know don’t really work quite right. Placement of the slits might also need to be altered to accommodate the tabs properly. So, I know there haven’t been very many Puck paper dolls lately… so here is one. He’s not the superhero I had planned on posting, but I think a little punk fella goes with the various other punky Pixie and Puck paper dolls I promised and posted (and yes, I do like alliteration, thank you much). As always, Trey can trade costumes with any of the other Puck paper dolls, so you can ger a variety of other costumes if you want them. And I’ve learned from Dover that perhaps I should call them “Paper Action Figures.” I love the robots and their costumes. Oh and I should had, his skin tone did not look so sickly when I originally chose it and somehow now I think he looks like he suffers from some skin condition… Sometimes I hate skintones. Have a question you’d like me to answer? Ask me. So, today, somewhat late, we have a new Puck paper doll named Jose. When I finished him, he looked like a Jose to me, so I decided that was his name. I like his nose. I am tired of school, looking for work and stressed beyond belief. In truth, this printable paper doll has been sitting on my hard-drive for several weeks waiting for me to finish it up, reformat it and then posting it. I am continuing to work on drawing more men. 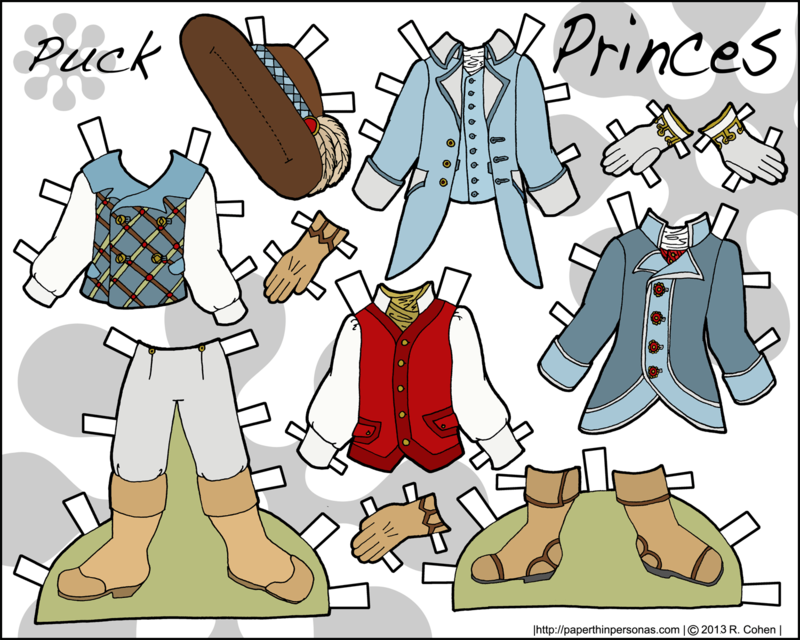 I have another male paper doll finished and I hope to get it posted maybe this week, maybe next. I’ve not been very on the ball with this blog lately and that bothers me. Life is very complicated these days. I’ll be happy when school is over, I have a job and I feel a little more settled. So when I asked people what they wanted to see on the blog, male paper dolls won out. I don’t really see the appeal myself- after a while, I think guys clothing gets boring, but I am trying to provide what people have asked for (also I have had this drawn for months and coloring it was fast), so here is Jesse- another Puck paper dolls. He joins the other Pucks which can be found with their female counter-parts the Pixies. In total, I’ve done six Pucks, I believe. I guess out of over 250 pages of paper dolls, six males isn’t much of a percentage, but it’s a lot higher than zero. Today’s Puck paper doll fits in pretty well with Dillon having another fairly standard casual wardrobe. I confess I don’t know much about male clothing, but I do my best with the Pucks. I did just notice I do seem to have a lot of blond Pucks… which is rather odd. I’ll have to work on that.